Grace above nature (“bottom-floor education”). Often associated with manualist Thomists. God’s gracious salvation is something that adds to, and fulfills, the natural realm. Grace against nature (“a plague on the educational house”). Often associated with certain Anabaptists and Pietists. The Fall corrupted the natural world ontologically in such a manner that God’s salvation causes Christians to withdraw from the world and live a Christian life separate from it. Grace in tension with nature (“pastors and educators as dual ministers of God”). Associated with Luther and some Reformed evangelicals. The natural realm and the realm of grace each have their own integrity, existing alongside of one another. Nature without grace (“a naked public quad”). Atheistic view. 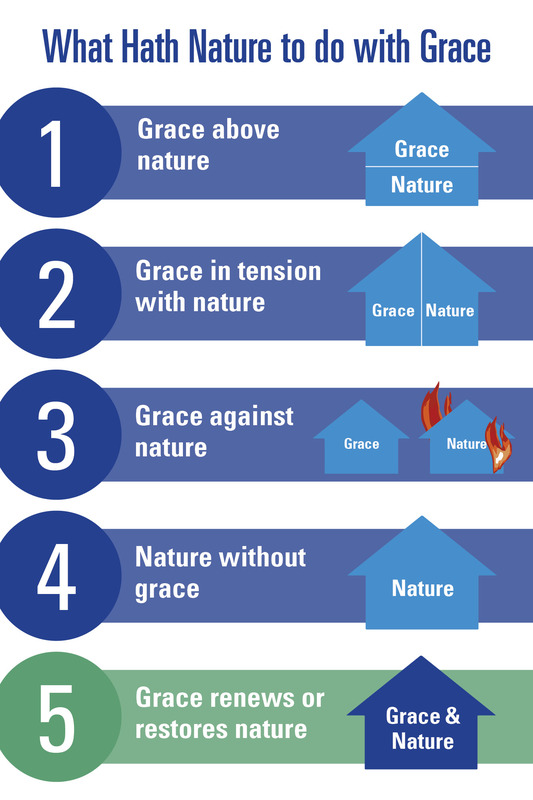 Grace renews or restores nature (“an educational preview of a coming kingdom”). Associated with Abraham Kuyper, Herman Bavinck and the best way to describe the views of Irenaeus and Augustine. Sin does not have the power to corrupt the natural realm structurally. Instead, it corrupts the natural realm directionally. God’s still-good-structurally creation is misdirected toward false gods and idols. When Christians receive God’s grace in salvation, they are liberated from their idolatry, liberated to shape their cultural activities toward Christ rather than toward false gods and idols. Their cultural activity is redirective. Ashford explains that all of the options—sans number four (nature without grace)—are advocated by various Christian traditions. He goes on to argues for the fifth view (grace renews nature). When God created the world, he created it good. He spoke his word, and his word called forth something from nothing, and then it ordered that world. It gave it a certain ordering, and that could be viewed as God’s thesis for the world. This is the way the world ought to be. But Satan . . . called that into question. He spoke a word against God’s word, and that . . . antithesis remains today operative everywhere, and operative in every human heart, even Christians. . . .
After the fall, the world remains structurally good but directionally bad. . . . The world the way it is ordered remains good. The fact that we have sun and moon and stars and dry land and water and human beings and animals— that’s good. And the fact that we have a certain cultural order is also good. Things like the arts and the sciences and politics and economics. . . . All of these sorts of things we do in this realm remain good in their what-ness. The fact that they exist is good. These creational and cultural things are not corrupted ontologically; we don’t have to separate from them. But they are bad directionally. Because sin is essentially a redirecting of the heart away from God . . . and because it is religiously rooted and located in the heart, it radiates outward into everything we do. And so we continue to be cultural beings and social beings, but all of our social and cultural doings are corrupted by sin and idolatry. . . .
Grace and nature belong together . . . Christ Jesus’ redemption should transform us in the entirety of our being, and as it redirects our heart from idols toward the one, true living God, it should then change the way we operate in culture. . . . His lordship is as wide creation, and therefore it is as wide as our cultural eyes. . . . Our mission, therefore, the Christian mission is as wide as the entirety of our cultural and social lives, involving both our words and our deeds and our teaching and learning. What is God’s creational design for this realm of culture? How has it been corrupted and misdirected by sin and idolatry? In what ways can I help bring redirection to this realm by shaping my activities in light of Christ’s Lordship rather than in submission to idols? Again, it’s worth watching and listening to the whole thing. For more, see Ashford’s book, Every Square Inch: An Introduction to Cultural Engagement for Christians (Lexham Press, 2015), and my interview about it here. What If “Nature vs. Nurture” Aren’t the Only Relevant Categories? But What’s So Wrong about Burning Out for Jesus?